^ "World Curling Federation - Past Olympic Results". World Curling Federation. Retrieved 2018-02-11. 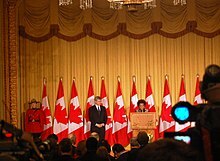 ^ Canadian Press (February 27, 2010). 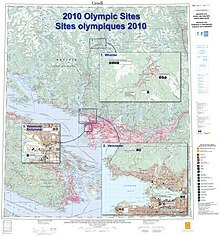 "Canada sets Olympic gold record". CBC Sports. Archived from the original on 2010-03-03. Retrieved February 27, 2010. 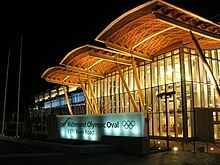 ^ "Olympic security estimated to cost C$900M". CBC News. February 19, 2009. Archived from the original on 2009-02-21. Retrieved January 25, 2011. 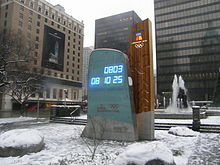 ^ "Winter Olympics Vancouver | Travel and Tourism". Tstsy.com. 2010. Archived from the original on 2011-07-17. Retrieved July 1, 2010. ^ "Sport | Kari Peters bleibt zu Hause". wort.lu. Archived from the original on 2010-02-20. Retrieved February 7, 2010. ^ "Countries". Yahoo Sports. Archived from the original on 2011-11-25. Retrieved August 8, 2011. ^ Native Warrior Society (March 7, 2007). "Native Warriors Claim Responsibility for Taking Olympic Flag". Infoshop News. Archived from the original on 2011-11-18. Retrieved February 17, 2010.